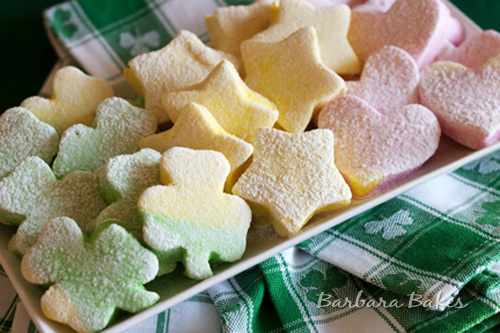 My pink hearts, green clovers and yellow stars are magically delicious homemade marshmallows. These puffy, light as air marshmallows are sprinkled with a sweet lemon coating and of course a little magic dust. 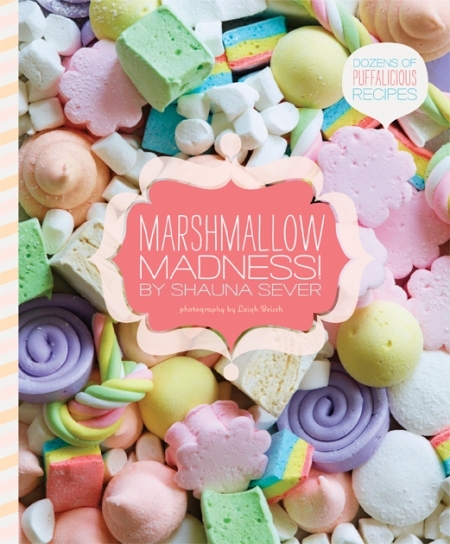 Marshmallow Madness, written by Shauna Sever, is the cutest little puffy cookbook all about making homemade marshmallows. It was sitting on my coffee table and every time I walked by it made me smile. The cover really is puffy! Details on how you can win one of two copies of Marshmallow Madness are at the bottom of this post. In addition to the fun, colorful cover, the book is well designed and filled with delicious, creative marshmallow recipes. 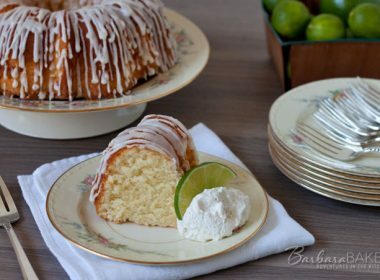 There is also a great introduction with tons of information on ingredients, tools, tips and techniques for making perfect marshmallows at home. The tip about adjusting the cooking temperature for high altitudes was particularly important for me. In the intro, Shauna talked about how much better homemade marshmallows are than store bought. It got me thinking about the worst marshmallows I’ve ever had which lead me to Lucky Charms. My kids love Lucky Charms, but I hate biting in to the hard, stick-to-your teeth marshmallows. So I decided to create my own Lucky Charm marshmallows. I doubled the Classic Vanilla Marshmallow recipe, reducing the whipping time by one minute. 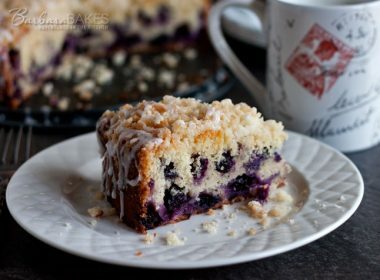 Then working quickly, divided the batter in to three bowls, stirred in gel food coloring and then poured the batter on to a baking sheet coated with cooking spray. To make my Lucky Charms magically delicious, I sprinkled them with magic dust (edible glitter). 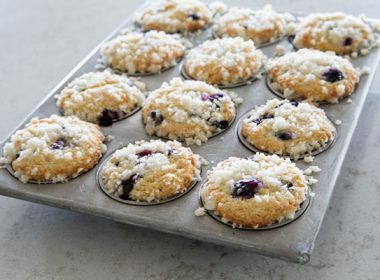 I also added lemon juice powder to the Classic Coating to give them a sun-kissed, sweet, tart flavor. 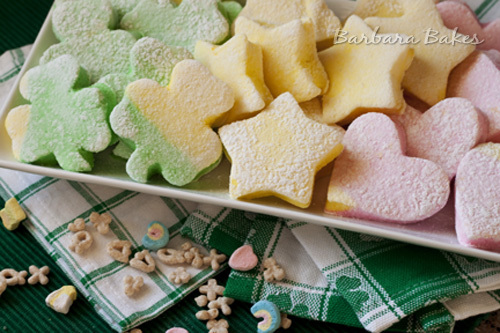 I used cookie cutters coated in the Classic Coating to cut the marshmallows in to the classic Lucky Charm shapes. The scraps I diced up and put in a bowl on the kitchen counter. Some how the bits in the bowl magically disappeared before the bigger marshmallows did. Quirk Books teamed up with Serious Eats to host Marsh Madness. 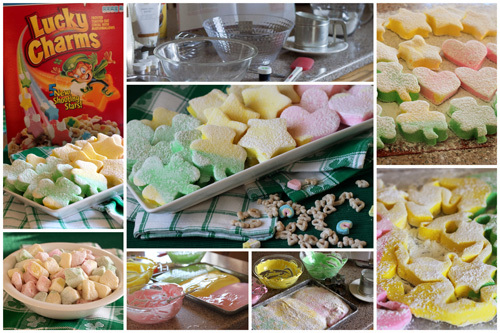 A fun March Madness type competition where bloggers from all over the country create fun new marshmallows using the Marshmallow Madness Classic Vanilla Marshmallow recipe. At the end of the tournmant Shauna gets to pick the winner. Not an easy job I’m sure. 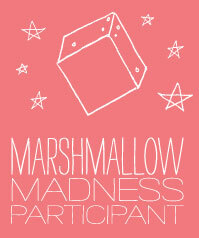 I hope you’ll checkout all of the participant’s creative and delicious marshmallow posts. This was my first time making marshmallows and I was surprised how easy they were to make using the great tips in Marshmallow Madness. 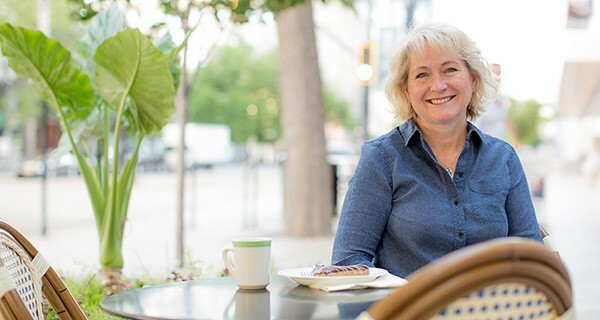 Shauna blogs at Piece of Cake. 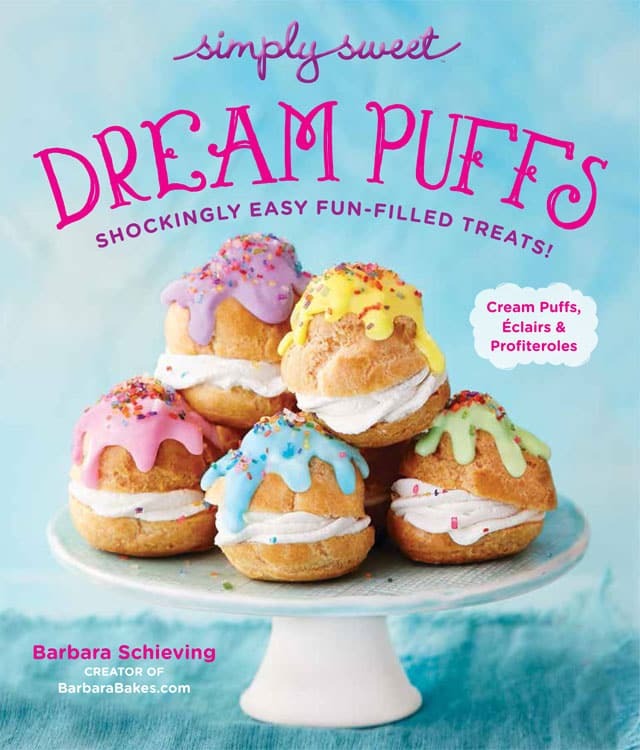 Quirk Books is giving away to two lucky Barbara Bakes readers a copy of the new Marshmallow Madness cookbook. Leave a comment on this post before Friday, March16th at noon, MST. 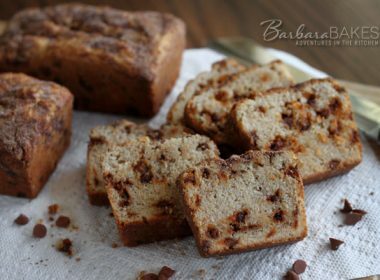 Like Barbara Bakes on Facebook. 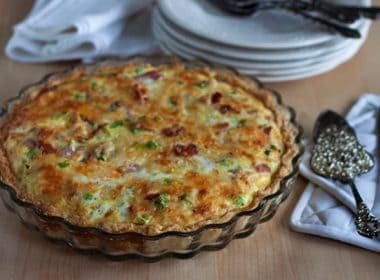 would love to try to make them! I made peppermint marshmallows at Christmas and would love the book to make more. Was so fun!!!! Love your website! I *love* marshmallows – especially the homemade kind. Those marshmallows are too cute. So creative. These are sooo cute! 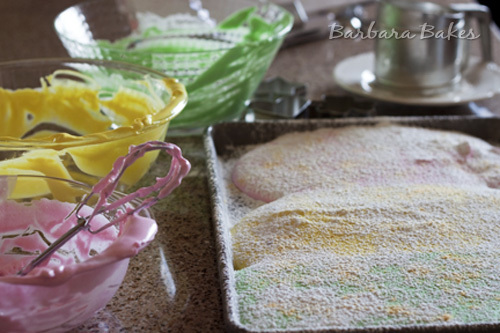 Love that you sprinkled them with the glitter, too!